The XYPN movement is growing rapidly. Yet it’s still an uphill battle to get the word out about what we do, who we help, and how it all works. When it comes to misconceptions, we've heard it all: "All members are 25"; "XYPN advisors don't manage assets"; "XYPN is only for new firms." Guess what? None of those things are true! 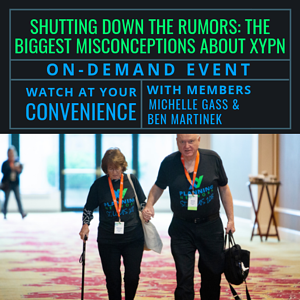 In this webinar, XYPN members Ben Martinek and Michelle Underwood Gass address the rumors and set the record straight. This recorded webinar is ideal for anyone considering XYPN membership. How does XYPN benefit career changers? How much of your day does compliance take up, and how can XYPN help? Does the monthly retainer model really work? Reducing the Lifestyle Practice Stigma: What Would Arlene Say? Michelle Underwood Gass, CFP®, CPA, and founder of Paradigm Advisors LLC, has always had a passion for helping people and resolving complex issues. Her diverse experiences working in different areas of finance–accounting, tax, family office environment, hedge funds and ultimately becoming an entrepreneur–make her uniquely qualified to serve the needs of her clients. Ben Martinek, CFP®, EA, is the founder of Bona Fide Finance, Latin for “in good faith.” Ben provides comprehensive advice for young families and professionals who are seeking to secure their financial position, accumulate wealth, and optimize lifestyle design. He prepares each client for their future according to the standards of good finance and good sense.